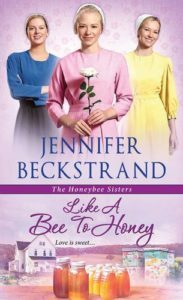 Like A Bee To Honey by Jennifer Beckstrand is the third and final book in the Honeybee Sisters series. It has been a fabulous trilogy and I am sad to see the end of it. Once again it can be read as a stand-alone but it is far better to read the books in order. The exploits of the Honeybee sisters, their unconventional Aunt B and the cats – Farrah Fawcett, Billy Idol and Leonard Nimoy – delight the readers once more. This novel focuses on Rose, the youngest and quietest sister. Rose is carrying a heavy burden. It’s a burden that she refuses to share and it’s root is in the past but it is affecting her present and has the potential to ruin her future. “No amount of wishing or even praying would change the past.” Rose needs to hand her burden over to God and remember that Jesus has already gone to the cross for all our sins. There is the theme of forgiveness in the novel. Forgiveness may be hard but it is essential. “He tried to be forgiving in his heart but it was hard.” Unforgiveness can lead to bitterness and may motivate people to act in a way they later regret. The story shows the importance of listening to and obeying God. “When Gotte tells you to do something, you do it, no questions asked.” God always has goodness at heart and wishes us to prosper. The wonderful sense of family, begun in book one continues in this book. The family is tight knit, pulling together and motivated by love. The mystery that unravelled in the first book reaches its climax. All of the reader’s questions are answered, particularly the ‘who’ and ‘why’. I have really enjoyed this series. There has been a wonderful feel good factor throughout this highly amusing series. There have been some classic one liners. The characters have all been uniquely drawn and are all very likeable. I am extremely sorry to have now finished all the novels and am leaving the Honeybee sisters behind. Highly recommended. A fabulous read. Julia, I’ve run out of superlatives to thank you for reviewing my books. I can only tell you how much I appreciate your thoughtful and very kind reviews and I am thrilled and honored you liked them. I remember several years ago I was in a minor car accident that was my fault, and I wished and wished that I could have those few moments back again. I think we all have had experiences like that in our lives, but you are so right that Jesus made all things right when he died for us. I love his message of forgiveness and hope. Thank you for reading! I loved the first book! So much fun to read! I have ordered the second one. Patiently awaiting it’s arrival! I really enjoyed the Huckleberry Hill Matchmakers Series. That scheming Grandma made me laugh out loud! I have not read any books in the Honeybee Sisters Series yet.